Having sold out months in advance it's evident tonight just how popular Tom Odell has become in such a short space of time. With only a debut album to his name the fresh faced artist definitely has had the most hectic of years with his musical career sky rocketing to success reaching number 1 in the UK album charts along with becoming rightfully named the BRITs' Critics' Choice Award winner 2013. As the band touch back down on British soil after an extensive US tour they kick off the first leg of the UK dates at Cardiff's Great Hall. With the queue snaking its way up and back down the street (the longest I've ever seen here) I thankfully managed to arrive inside just in time to catch George Ezra take to the stage. The Bristol resident has been causing rippling waves for quite some time with his music being picked up by the likes of Zane Lowe adding to a continuously growing fan base. 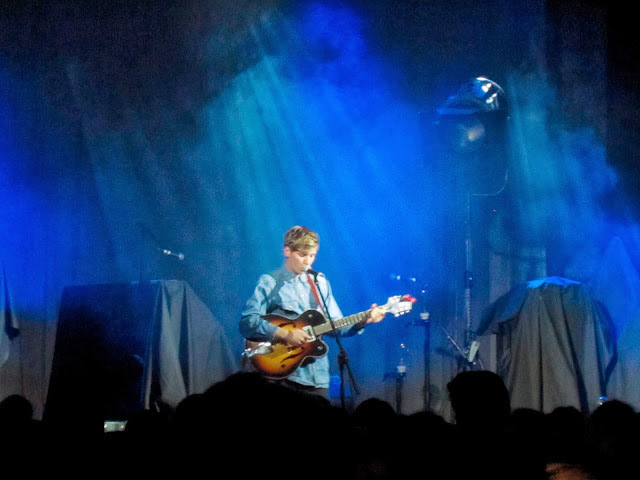 With just a guitar acting as a makeshift barrier between him and the crowd his calming confidence oscillated over the audience as he moved through a joyous 7 track set. Starting the evening's proceedings with the piercingly beautiful Blame It On Me his distinct and powerful voice echoed around the high ceilings of the Great Hall, quickly quieting the remaining conversations amongst the crowd. His often Folk-attenuated guitar picking only acts to enrich his vocal clarity providing further depth to his already rich abilities. With added influences of Blues and Soulful rhythms what we hear tonight is a amalgamation of pure, unique talent. This, all evidently displayed on single Budapest and most recent effort Did You Hear The Rain show just how fragile yet commandeering his music can be through its simplistic tremors and flutters of hope. A truly brilliant performance, one of which I hope I can repeat again soon. With a slightly longer wait than expected as anticipation grew amongst the crowd the looping CD finally died away to much arousal and cheers from the audience. If you've listened to Odell's album then you'll have had first hand experience at just how magnificent his skills are for creating soft and subtle tones before unleashing an unforgiving force of power upon you. The same goes for his live show. Through a balance of heartache and loveless storytelling, told in such an equitable and sincere way the aptitude within his music unravels and encapsulates leaving no stone unturned. At just 22 most could only dream of nurturing such talents as he wastes no time before demonstrating such skills opening with Grow Old With Me. Bouncing around on his stool bashing piano keys with an almighty ferocity I wonder how he hasn't fallen off yet with such vigorous playing, the crowd watching on mesmerised, mimicking each of his every word as they stand rooted in their place with such brilliance. Moving in to the more quieter Sense Tom allows himself and the crowd to catch their breath. It's a shame not everyone does though as some begin to mutter amongst themselves around me. I've never understood and probably never will how people part with their hard earned cash to talk through a performance but each to their own I guess. This aside the pace is racked back up once more with an endearing and quite frankly daring cover of The Beetles' Get Back, I mean not everyone can get away with covering such an iconic band in true fashion paying it justice. With Another Love getting the biggest reaction of the night and the band returning for a 3 track encore the 14 track set was over all too quickly. Playing through the majority of his critically acclaimed debut album, by the evenings end, whether Odell brought the crowd to a flurry of emotion as they danced around, or cultivated an abstemious aura, it was evidently clear that his incredibly raw talent has blossoming potential. 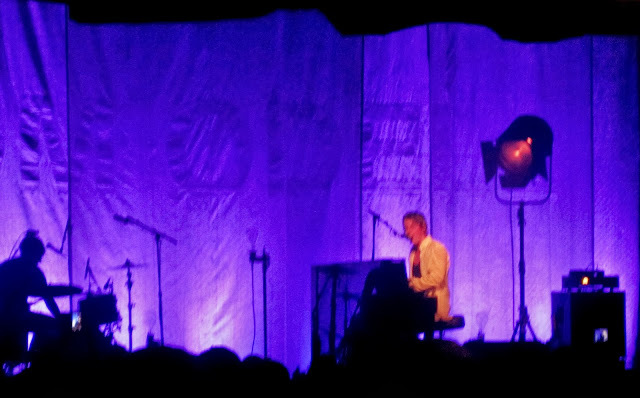 The true magnitude of seeing Tom Odell live is something everyone should experience at least once in their lives. 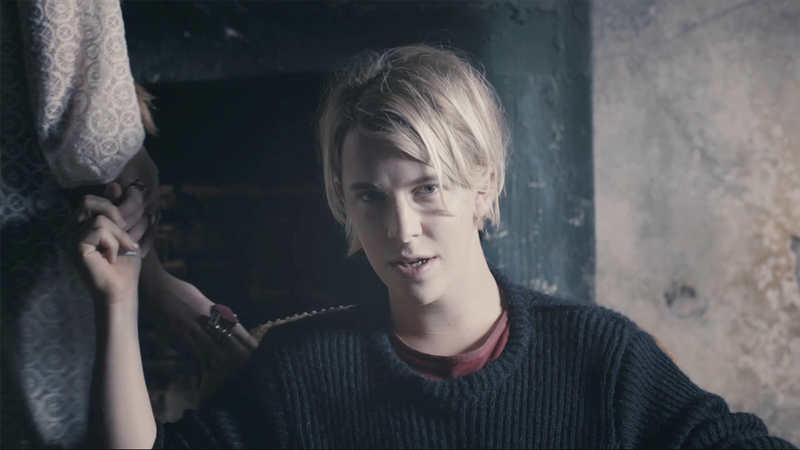 Tom Odell will go on to play the following dates below.